If you have horns or relays fitted to your vehicle, you should fit a catching diode across each to prevent a damaging voltage spike, why? read on for the full story…. A coil (of any sort) is an inductor. Inductors behave to electricity as mass does to a mechanical system. Inductors resist change in current flow, just as masses resists change in physical movement. In the same way, if you suddenly try to stop the current flowing in an inductor – the inductor will resist the change in current – by developing a large voltage spike. This voltage will cause an arc across the switch that is interrupting the current. This will eventually burn the switch, but in the short term, it causes electrical noise, which can have all sorts of effects, such as making electronic equipment misbehave – or even fail. Clearly, what we need is some way of interrupting the current flow slowly – a method of letting the current die away slowly. This is what the catching diode is for. When the switch is closed, voltage is immediately applied to the coil. But because the coil has inductance, the current must be ‘pushed’ before there is any flow – your engine must push the mass of the car to build up speed (flow). So it is with the coil, current builds up relatively slowly, until eventually it has risen to the steady state value defined by the voltage and the coil’s resistance. When the switch is opened, current simply cannot keep flowing. But the inductance of the coil says that it must. 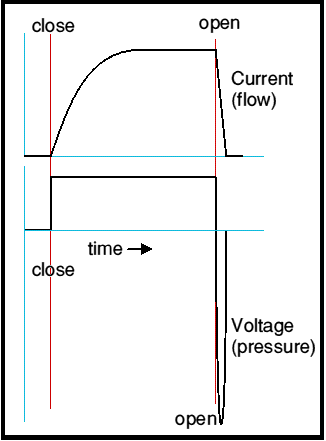 Inductance makes it impossible to stop current immediately. So the inductor kicks furiously and creates a large enough spike in the voltage to keep the current going! Notice that this is a negative spike, so adds to the battery voltage, creating a large surge voltage across the switch. This voltage spike will cause an arc across the switch. It will also cause energy to be radiated as electromagnetic noise – a radio interference spike. The energy stored in a coil is 1/2Li2, where L is the coil’s inductance in Henries, and i is the current on amperes. The energy is in Joules and, for something like an industrial mains contactor – it can be quite significant. If the switch arcs, this energy is then dissipated as heat in the arc and it is this heat which causes the switch contacts to be burned! We now have a coil full of stored inductive energy in series with a diode and it own series resistance. 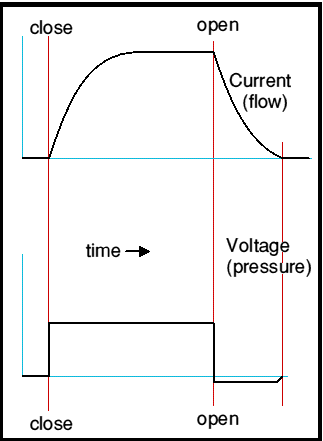 The current will decay with a time constant of L/R where L is the coil’s inductance and R is the coil’s resistance. Notice how the spike, that was, is no longer present – but instead the current takes a long time to decay. During the time it is still flowing, there is a 0.6v ‘hump’ in the voltage – the 0.6v is the forward conduction voltage of the flywheel diode, which is of course conducting during this period. Since the current takes a long time now to die, the relay or contactor or whatever also takes a long time to de-energise. That may not be desirable. However it is possible to tailor it. With no flywheel diode, de-energising is very fast. 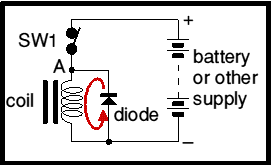 No flywheel diode is the same as a flywheel diode in series with a very large value resistor, With only a diode and a zero value resistor, de-energising is slow. So, presumably if we choose the resistor in series with the diode correctly, we can make the release time whatever we require. This is quite true: relays take a time to energise and they also take a time to de-energise. In most cases the optimum release time is about the same time as it takes the relay to energise. You will get that sort of timing by putting in series with the flywheel diode, a resistor of value equal to the coil resistance.